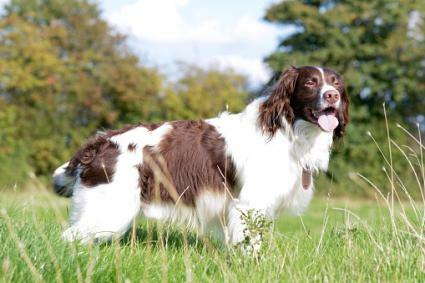 The English Springer Spaniel is equally at home in the field or the show ring, but for these purposes the breed has developed into two very distinct types. Come meet them both! 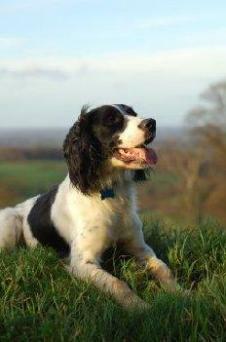 The English Springer Spaniel is an outstanding gun dog and a wonderful family companion. This is a handsome, medium-sized breed of sturdy build, with a great attitude and an eagerness to learn. The breed traces its history back to Spain, most likely transported from there to England by the Romans as they made their way across Europe. It's not uncommon to find two distinct "types" within a single sporting breed, but Springer types look so different from each other that many people mistake them for separate breeds. Let's take a closer look. English Springer Spaniels bred for field work are leaner in appearance than their show dog counterparts, with shorter coats suited to running through tall grass and shrubbery. This type also carries a great deal more white hair in its coat. In countries that allow docking, the tails on field-bred Springers are docked only a few inches so hunters can easily track their dogs as they move through the brush. Additionally, some dogs may display tan facial markings and freckling throughout the white portion of the coat. The hallmark of the English Springer Spaniel is its friendly nature. You'll seldom encounter one of these dogs without receiving a warm greeting and that signature non-stop tail wag. They are highly intelligent creatures and very cooperative as a rule. These dogs are also extremely devoted to their owners and really seem to prefer their special person's company over that of other canines. This endearing trait can become a problem if it's overly encouraged. Some Springers become neurotic when separated from their owner, even if only for a few hours. This can result in destructive behaviors like chewing, digging and house accidents. To discourage this kind of behavior, you really need to socialize your pet as a pup. Get him out to meet and make friends with as many people as possible. If he's isolated to the company of just one person during his early development it will affect his behavior the rest of his life. Just as field and show English Springer Spaniels display a difference in looks, there is also a slight difference in temperaments. Field Springers are usually a lot more energetic since they've been bred to endure long days flushing and retrieving game. On the other hand, show types are generally easier going, tending to be slightly easier to deal with as house pets. Overall, a well trained Springer of either type makes a wonderful companion no matter where you are. Training for field work comes as naturally to this breed as breathing. Other training such a house training and obedience must be worked at in a gentle but firm manner. An English Springer Spaniel is eager to please and takes reprimands strongly to heart. For all their buoyant behavior, this breed is really quite soft, so handle all training with care. Springers tend to live long lives, easily reaching twelve to fourteen years of age. Even so, there are health concerns and within the gene pool that conscientious breeders are working to address, and the breed may be prone to certain diseases. Springers have often won Best of Breed at the Westminster Kennel Dog Show, with the first time being in 1963. The English Springer Spaniel makes a wonderful family companion, but be sure you are prepared to bring one of these high-spirited dogs home. Spend as much time as you can around puppies and adults to judge if this is really the breed for you.